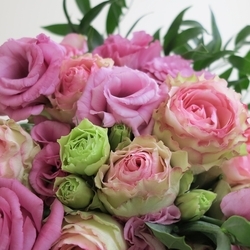 Glitzy, trendy hand tied bouquet of pink roses and pink & green lisianthus flowers. Gift wrapped, no container. Recommended as: Birthday flowers, Thank you flower bouquet, Anniversary arrangement or Get well floral gift; just a click, tap or call away.Flower delivery in Toronto and GTA. 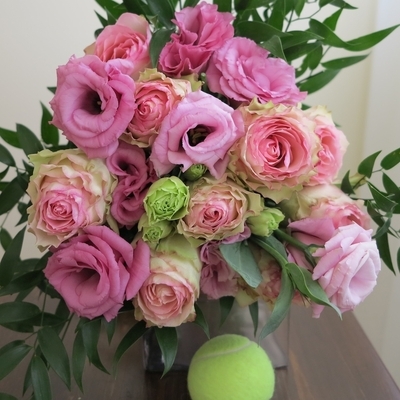 Enjoy mobile and online shopping at top Toronto florist. If you need assistance please call our Toronto flower shop. We offer downtown Toronto flower delivery.